The Hotel Du Parc is a 3-star superior hotel which is characterized by the presence of a panoramic swimming pool and a gourmet restaurant with à la carte menu. Located just a few minutes walk from the sea, it offers free WI-FI, air conditioning and a terrace lounge bar. Admits animals of small and medium size. The hotel is located near the center of Gabicce Mare, in a quiet area on the edge of Mount San Bartolo. Its privileged position, with panoramic views of the coast, allows guests to reach the beach in less than 5 minutes on foot. Fully air-conditioned, all rooms have a balcony (with sea view on request), satellite TV and digital terrestrial, safe, WI-FI connection, minibar, bathroom with shower and, on request, hairdryer. COMFORT: recently renovated, they have all the services listed above above. SUPERIOR: the services of the comfort rooms add premium services such as sofas and armchairs. SUITES: they have a large shower and 2 terraces, one of which has a panoramic sea view. They consist of a double bed, a living area with a sofa that can be transformed into a single bed or a bunk bed. Panoramic swimming pool, garden, terrace bar with small restaurant, solarium area, free bicycles, lift, lobby bar, reading room with TV, conference room, 24h reception and wellness area with massage and beauty treatments room. The hotel is equipped for cyclists and has a storage room for bicycles. On request: shuttle service to the railway station and organized excursions. PARKING: available on request and with additional parking spaces inside or outside (the second outdoor parking is 1km away from the hotel and is served by a free shuttle). WI-FI: free throughout the entire structure. In addition, it has an internet point terminal in the lobby. AIR CONDITIONING: in all rooms, free even in the room. PETS: small and medium-sized pets allowed with a small supplement. BREAKFAST: buffet, with sweet and savory choice until late morning. It includes coffee drinks, teas, infusions, croissants, ring-shaped cake, pies, cereals, fresh fruit, natural yoghurt, bread with sourdough, plumcake, pancakes, waffles, toasted seeds, dried fruit, cold cuts, bacon, eggs and cheese. LUNCH AND DINNER: the structure has a restaurant "Mare Mosso" where there is an à la carte menu with both sea and land, fresh pasta is homemade and dishes are accompanied by salads, desserts, homemade ice cream and fruit. There is a second terrace restaurant with exclusively fish dishes. VARIATIONS: the menu is suitable for vegetarians and the staff prepares, on request, dishes for vegans or gluten-free recipes for celiacs. In the hotel: strollers available to parents. Baby-sitter and pediatrician services available on request. In the room: cots on request. At meals: seats at the table, baby food and baby menu on request. At the beach: entertainment service. 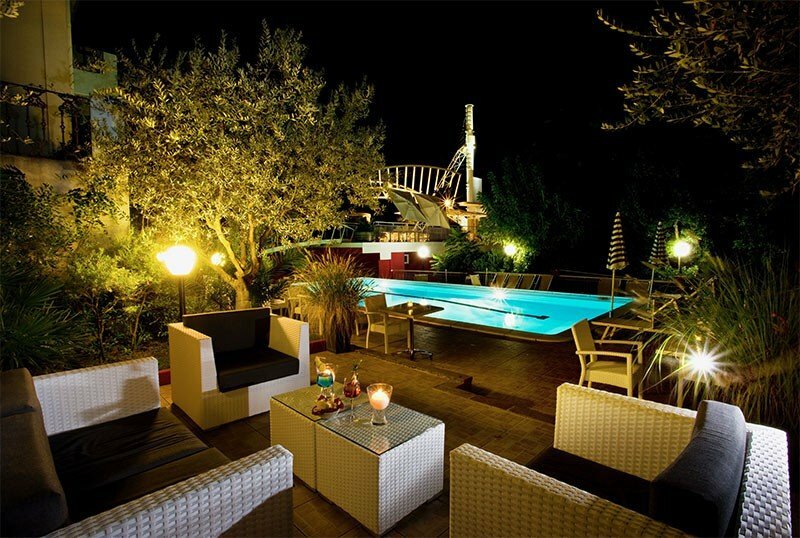 The hotel has a swimming pool located on the terrace, like the Terrace Bar, in a quiet and peaceful location. The pool is surrounded by a solarium area with sun loungers, parasols, chairs and tables. Here the staff organizes theme nights and poolside aperitifs. The hotel has an agreement with the Bagni Gianni Marcella bathing establishments no. 36 and Bagno Franco n. 37. In addition to sun loungers and parasols, the bathrooms offer a playground area for children, entertainment service, bocce courts, pedal boat rental, nursery with changing table, hot showers and a relaxation area with gazebo. - lunch and dinner in our "MareRosso"